Frédéric Chopin, a Polish composer (a writer of music) and pianist, was one of the creators of the typically romantic character piece. All of his works include the piano. Frédéric François Chopin was born on February 22, 1810, near Warsaw, Poland. He was the second of four children of Nicholas Chopin, a Frenchman, and his Polish wife, Justina, who had been a well-educated but poor relative in the Skarbek household, where Nicholas had been a tutor. At an early age, Chopin displayed artistic talents—he was an artist, wrote poetry, and played piano without any formal instruction. The gifted child also began composing his own music and had his first piece of music published when he was just seven years old. Young Chopin had a good education and later studied music privately with Joseph Elsner, founder and director of the Warsaw Conservatory. In 1817 Chopin's first composition was performed publicly. A year later he himself performed in public, playing a concerto (music written for one or more instruments) by Adalbert Gyrowetz. By this time the young Chopin began drawing comparisons to Wolfgang Amadeus Mozart (1756–1791), another composer who had demonstrated spectacular talent at a young age. In 1826 Chopin became a full-time student at Elsner's conservatory, where he received an excellent foundation in theory, harmony, and melody. Elsner, after recognizing that Chopin's style was too original to force into traditional patterns, granted Chopin the freedom to develop along clear personal lines. After visiting Berlin, Germany, where Chopin was exposed to the music of George Frederick Handel (1685–1759) and Felix Mendelssohn (1809–1847), Chopin returned to Warsaw and heard Nicolò Paganini (1782–1840). Chopin recognized that he must leave Warsaw for exposure to other musicians. He went to Vienna, Austria, to try to arrange the publication of several of his works. After a successful debut at the Kärntnerthor Theater on August 11, 1829, he returned home only to prepare for a concert tour, this time through Germany and Italy. In Vienna Chopin composed the B Minor Scherzo and the G Minor Ballade, as well as others that demonstrated Chopin's fully developed personal style. When the twenty-year-old Chopin arrived in Paris, poor physical health prevented him from giving public performances. Nevertheless, he became a significant figure in Parisian artistic circles, numbering among his friends musicians, writers, and painters, as well as many wealthy and talented women. Chopin recognized that he did not have the stamina (strength) to compete in public against such talents as Franz Liszt (1811–1886) and Sigismund Thalberg (1812–1871). So long as he was able to earn enough by teaching, Chopin preferred composition to playing concerts. His musical tastes were public knowledge. Friendly with Hector Berlioz (1803–1869) and Mendelssohn, he was not impressed with their music. Nor, for that matter, did he appreciate Robert Schumann's (1810–1856) work, despite Schumann's warm welcome written for the Neue Zeitschrift für Musik when Chopin first arrived in Paris. Schumann introduced Clara Wieck to Chopin's work, and eventually her performances of Chopin's pieces made favorable impressions on many audiences. Several young ladies appear to have been the object of Chopin's affections over the years, but the most celebrated female with whom he had a relationship was Aurore Dudevant, known as George Sand, whom he met in 1836. For nine years, beginning in 1838, after he had composed the "Funeral March" (which later became part of the B-flat Minor Sonata), she was his closest associate. Despite failing health, the composer completed his twenty-four Preludes in Valldemosa, Majorca (one of the Balearic Islands in the western Mediterranean). In 1846 Sand's children became a problem. Chopin sided with Solange, Sand's daughter, in arguments against Sand and her son, Maurice. Separation became inevitable, and the beginning of the end for Chopin. His health failed, and he lost all interest in composition. Chopin then moved to England, where he gave several private performances in London and on May 15 played for Queen Victoria (1819–1901). After a rest in Scotland, he returned to London in the fall of 1848, where on November 16 he played a benefit for Polish refugees at the Guildhall. He returned to Paris shortly afterward, where he died of tuberculosis (a disease that attacks the lungs and bones) on October 17, 1849, in Paris, France. Although Chopin's output was rather small compared to other great composers, his works such as his sonatas (music for one instrument) in B flat minor (1840) and the concertos in E minor (1833) are still some of the most popular pieces in classical music. Dineen, Jacqueline. 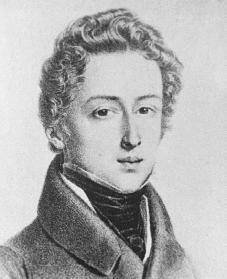 Frédéric Chopin. Minneapolis: Carolrhoda Books, 1996. Vernon, Roland. Introducing Chopin. Parsippany, NJ: Silver Burdett Press, 1996. Walker, Alan, ed. The Chopin Companion; Profiles of the Man and the Musician. New York: W. W. Norton, 1966. Zamoyski, Adam. Chopin: A New Biography. Garden City, NY: Doubleday, 1979. I've never really listened to Chopin's music, but I got to hand it to him, his music is just phenomenal. Just love it. Oh, by the way, great information on him. Although he died at such an early age of 39, him music and talents will forever live in our hearts, be it his fans or people that just love his music, like me now. I never knew a guy like Frederic Chopin could become like this famous. He is all over the world. Mostly all people know him!! Its very good information I gotta say though. And, it is very heartbreaking he dies at the age of 39!